Asylum seekers and refugees rely entirely on the Hong Kong Government and Social Welfare Department (“SWD”) distribution of government assistance provision through International Social Services (ISS-HK). They are not allowed to work and are sentenced to 15-22 months imprisonment if arrested working. They have no savings, no income, no bank account, nor can they rely on social networks, NGO assistance or help from family and friends. Under these conditions, they are not afforded adequate support to meet their most basic needs. While they struggle to survive, the situation is degrading, humiliating and in breach of their rights as persons granted non-refoulement protection in Hong Kong. Over the years they have repeatedly requested to bring their assistance to an adequate level, but they have been systematically and incomprehensively left in a destitute state. The limited and insufficient assistance they receive makes it impossible for them to survive on a day to day basis, particularly in the face of soaring rents. 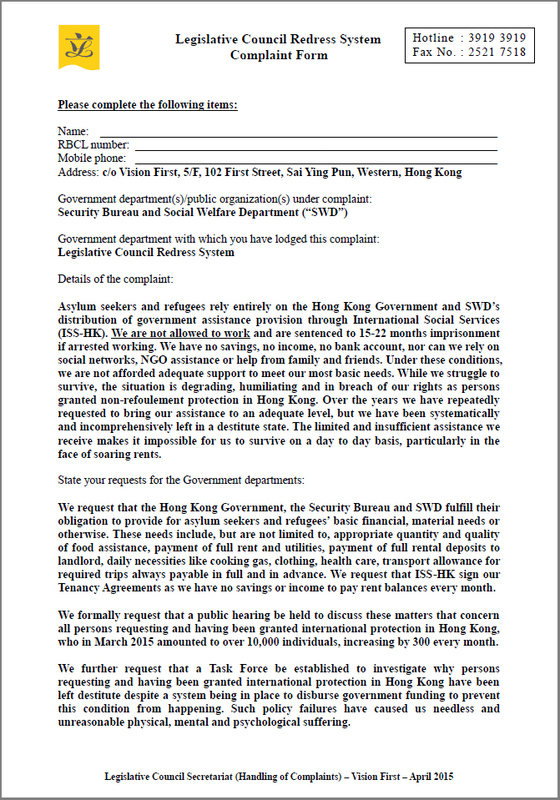 Vision First request that the Hong Kong Government, the Security Bureau and SWD fulfill their obligation to provide for asylum seekers and refugees’ basic financial, material needs or otherwise. These needs include, but are not limited to, appropriate quantity and quality of food assistance, payment of full rent and utilities, payment of full rental deposits to landlord, daily necessities like cooking gas, clothing, health care, transport allowance for required trips always payable in full and in advance. We request that ISS-HK sign the Tenancy Agreements as refugees have no savings or income to pay rent balances every month. We formally request that a public hearing be held to discuss these matters that concern all persons requesting and having been granted international protection in Hong Kong, who in March 2015 amounted to over 10,000 individuals, increasing by 300 every month. Vision First further request that a Task Force be established to investigate why persons requesting and having been granted international protection in Hong Kong have been left destitute despite a system being in place to disburse government funding to prevent this condition from happening. Such policy failures have caused refugees needless and unreasonable physical, mental and psychological suffering. Vision First invites refugees to download and complete the form below that will be filed at the Complaints Office of the Legislative Council Secretariat over the coming weeks and months.